JoeSeki: White 40 to get a base on the side. Your three-stone wall is a bit too far away from P11 to bridge the gap and confine me to the side. With my white stones getting out into the middle, I'm pretty safe. As I look at the board. The only weak white group is the one I'm settling now and it's not that weak. All other stones for White are settled or can be easily. Black has two weak groups on the board now and a moyo in the top right. I'm feeling comfortable, but can't rest on that thought. JoeSeki: Black 39 was said to look awkward by the high Dans in the Cleveland Go club. They experimented a bit to exploit it as best they could, but didn't come up with a convincing reason for why it's not good. In the end they said it was a poor connection which would be exploited later. A one-point jump is better, but the move they all wanted to play was R8 instead of the one-point jump. It settles your lower left stones which are very weak now because White got out into the middle. DJ Black 39: At this point of the game I cannot stop you from coming out. Therefore I leave the situation in the lower left as it is, and play from a direction I believe natural and very basic: expanding my moyo while attacking your lonely stone. Joeseki Arrrghh! I had a great set of comments about the moves, and a lightning strike cut out the power, so I lost it all. Now I'm too tired to type it all back in. JoeSeki I'll add a separate page with my thoughts another day. JoeSeki White 38: If you are willing to leave weak stones behind then so will I, the key to those weak stones will be center thickness, so I make sure you don't get it. I fear that if I took the extension towards your side stones, you'd grab the thickness in sente, and then not have to worry about your weak stones. For that reason I move out. JoeSeki: Black 37 should take the big sente point at F5. It's a free move and makes this move beautiful. This is a great teaching game: it forces me to think on the implications of each move (while playing in the cyberspace untaught me to analyse...) and it has already showed me one of my defects: despite all my good resolutions, I cannot resist and sooner or later making a reckless move. Here's one. Should I have defended the three stones? Doesn't the double-wing formation look good, although a little cramped?? Should I have considered the two extensions on the right side as miai and waited to see which was better??? What if you played R12 right away???? Joeseki: Very interesting. You think fourth line and closer is more severe? I would think you could slide underneath me to get some eye space and I'd be floating. I thought the third line is more severe. I considered one closer, but that would let you extend from the top right further down and I'd be just as cramped. I never know how to attack properly. Any comments from the stronger players? Any comments on other possible thoughts from the observers of any rank? - For me it is still sort of a moyo game (I love Takemiya...). I choose thickness in the lower left, so I want to be consistent. Also, I was expecting a much more severe attack on my three stones (say around j), so I wanted to play high to offer whatever possible help to their running away... And what if somehow I manage to play first around k??!? - As I said, I was expecting an attack at j, to punish me for not having finished the joseki... so I am sort of grateful for R10. JoeSeki White 36: I can get a two-space extension on either side. So when you approach me you have to decide, do I hurt your unfinished lower right, or do I hurt your shimari? Even with all this I still feel this is where I go wrong in my games. It's obvious I need to come into the right side, and R10 seems the best point, but is there something better I should be considering? Or is it good enough? Bill: Better one point closer to Black's wall (b or j). You should be thinking pincer, not wedge. JoeSeki: Why did you play high? Isn't my stone at E17 peeking under any potential territory you could make on the top? If you are going to play on the top I think you should play on the 3rd line. This isn't a moyo game any more, and the fourth line is for influence, and I just don't see that happening for you here. I think a third line move was a must here. Any comments from others? JoeSeki: I would have taken R9 as my black move. Not only is it Joseki but it is also an extension from your shimari at the top. Granted it's the lesser-valued extension, but it's still a dual purpose move. If I compare White's extension to L17 to Black's extension at R9, they are about the same value extension-wise. The difference is that White gets in front of Black's shimari, but Black completes a joseki. JoeSeki I brought this game to the Cleveland Go club where some very strong dan players are to review what's been said before. They said Black 35 should have been at F5. Then taking the big point L6 appealed to them. It works very well with your high approach in my lower right corner. Bill: I wondered why Black didn't play F5 at move 27 or 29, but I am not up on that variation. And why did Black not play on the right side? The Black wall in the bottom right has no eyes, and needs an extension. Really, White 32 was brill, and put me in a dire spot. Joeseki White 34: Peaceful move by me with a lot of potential for later. It seems I have no other move than this. Tout ça c'est pénible! JoeSeki White 32: Trying to take sente. If I had dropped down rather than close the gap, you could treat these stones as light and play elsewhere. Even if you didn't treat them lightly and completed the associated joseki, you'd have an open skirt on the right but you'd also have sente. I want to be first to play at the top. Bill: But the exchange, - is not so good for White, because of Black's thickness on the bottom left. Where is White going with ? JoeSeki said: "...I'll take the profit. I think if I had Black I would have played at the 3-3 point and taken the profit away from White. Any outside influence White gets won't be that beneficial, I think. DJ Black 31: Indeed I was considering taking profit myself, not by entering at sansan but playing at the marked white stone. You would have pressed and so on. My problem was: is it correct to let you build thickness in face of my thickness? Well, I just don't know: strong players, any hint? JoeSeki I hope a high Dan player will make some comments about our direction of play when it's appropriate. I'd hate to think this is a case of "The blind leading the blind"
dnerra: Hmm, I am not sure about the result after Black enters at the square-marked stone instead of Black 29. If White presses with the usual knight's move, and Black chooses the usual joseki, we have a white wall facing black thickness. But White is first to get an extension, so this favors White a little. JamesA: Really interesting game! Black 29 is a difficult move to decide upon. How about playing 1 below, to extend from the top right shimari. 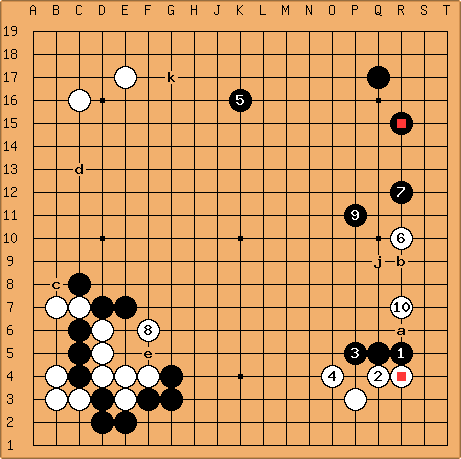 Then, if White makes a shimari in the bottom right Black gets a fantastic move at m - preventing White's extension and also creating a double-wing enclosure. However, looking at this position I think Black may have a difficult game (White has sente), so 3-3 may be the way to go (Black gets territory and White's thickness isn't too valuable because of Black's opposing thickness). The problem is that White has quite a bit of territory already and his stone on 3-5 in the bottom left makes it difficult for Black to get compensation with his thickness. I'm worried about the territorial balance for Black after White 28. After the actual Black 29 and the following joseki it is very hard to find a good move for Black 35.